After dazzling a partisan crowd with his acrobatic drives to win his second straight Slam-Dunk Championship, hometown hero Michael Jordan tossed in 40 points to lead the East to a 138-133 victory at Chicago Stadium. Only Wilt Chamberlain, who had 42 points in 1962, scored more in an NBA All-Star Game. Jordan sealed the MVP Award when he scored 16 points in the final 5:51 to assure the East's triumph. He also had 8 rebounds, 4 steals, 4 blocks, and 3 assists. Utah's Karl Malone led the West with 22 points. 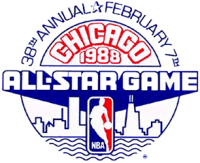 And 40-year-old Kareem Abdul-Jabbar, appearing in a record 17th All-Star Game, broke the career All-Star scoring record with 10 points for a total of 247, topping Oscar Robertson's 246. The best store builder by ShopFactory powers D536. All-in one store builder and eCommerce software.